The rivalry between Sonic and Mario was one of the most iconic times in the history of gaming and, to this day, those who lived through it still express disbelief at Sonic’s repeated presence on Nintendo systems. Granted, most of those are people who can’t believe Mario and Sonic’s team-ups have consisted solely of Olympic tie-ins, but while Lost World doesn’t involve the moustachioed plumber, it does take more than a few cues from his legacy, and with great results. 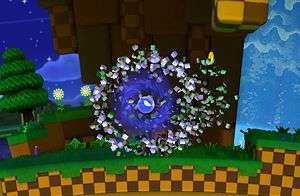 At a first glance, Sonic’s Wii U exclusive foray looks more than a little similar to the absolutely-stellar Super Mario Galaxy titles, both of which are two of the best games I’ve ever played. With that in mind, I was expecting myself to find Lost World to be Sonic’s cheap imitation of his former rival, and instead found that not only are the comparisons barely apt, but that this is already on-track to be the best 3D Sonic around. Admittedly, the loud-mouthed hedgehog hasn’t had the most impressive track-record when it comes to the third dimension, but it seems that this time they’ve finally stumbled upon a winning formula, and throughout the demo I found myself having the most fun I’ve had with the series since Sonic 3 & Knuckles. With three different acts on display in the demo, each one felt intricately and tightly designed; nothing felt superfluous, and at any moment you could find yourself taking any number of routes to the end of the level. Encouraging that exploration is the inclusion of collectable red rings in each stage, either hidden away in an alternative route or displayed prominently to tease those who haven’t figured out how to reach them yet. Even when watching someone else play through the exact same stages that I’d just completed, they’d managed to find a completely different way to reach the end, whether it was because they’d spotted something different in one of the many “blink and you’ll miss it” moments, they were carrying more speed during a certain part of the stage, or they were simply better at playing than I was. Not every stage is a third-dimensional sprint to the finish, as one of the stages hearkened back to the side-scrolling days with a level made up of enough sweets to make me consider getting a diabetes test just from looking at it. Weirdly enough, despite moving from left to right always having been Sonic’s forté, I actually found myself wanting the stage to hurry up and finish so I could get back to another 3D level, although I think this is partially down to the fact that the homing attack – a feature that’s still heavily debated by fans as to whether it’s ruined the series or not – feels slightly pace-breaking here and felt like a cheap way to move forward at the cost of momentum. In fact, the momentum and controls are precisely why it feels like Sega have hit the nail on the head for Lost World; Sonic no longer automatically sprints, and to do so the player needs to hold down one of the trigger buttons manually in order to get him up to speed, allowing for far more precision during some of the trickier platforming segments, none of which feel cheap thanks to the great level design. With the control far more in the hands of the player rather than the game itself and the action more focused on frantically-paced platforming that mostly punishes mistakes by shutting off access to other paths to the finish line, this is the 3D Sonic title that people have been holding out for since the days of the Dreamcast. 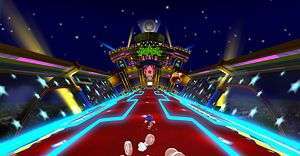 Sonic Lost World feels like a must-have for the Wii U and not just because of its exclusivity to the platform. Instead, I’m anxiously awaiting its release because after all these years Sega have finally sat down and addressed all the complaints and the biggest problems with taking the rowdy hedgehog into the third dimension. While I came into the demo feeling cynical, I left it convinced that Lost World will be Sonic’s finest outing to date.